Intel hopes to reignite excitement in tablets with its new Atom chips code-named Cherry Trail, which will be in devices in a few months. The chipmaker wants to eliminate tablet usage hassles like fumbling for wires and typing in passwords with its new Atom X5 and X7 chips, which are being announced at the Mobile World Congress trade show in Barcelona. Tablets with Cherry Trail will be priced from US$119 to $499, and have screen sizes from 7 to 10.1 inches. Asus, Lenovo, Acer, Dell, Toshiba and Hewlett-Packard will ship devices with Atom X5 or X7 chips in the first half this year. The Cherry Trail tablets will come with Windows or Android. The chips are also faster and more power-efficient than the current batch of Atom chips called Bay Trail, which are shipping in many tablets today. Like it did with PCs, Intel's trying to explore new usage models in tablets through its X5 and X7 chips. For example, a feature called True Key will allow users to log in to devices through biometric authentication like face or fingerprint recognition. Intel has said the technology could be applied to log into email and bank accounts in the future. Intel also hopes to replace mundane 2D tablet cameras with its RealSense 3D depth sensing camera, which will bring a new dimension to photography and video interaction. The camera is in its early stages, but it can make Skype conversations more interesting by masking and changing backgrounds. Much like human eyes, the RealSense camera can also track depth, recognize objects, and provide information such as distance between objects in 3D images. Tablets will also be able to scan 3D objects which can then be printed on 3D printers. A bunch of "wire-free" technologies to charge laptops, transfer data and connect to monitors are being introduced in tablets with Cherry Trail. If tablet screens are too small, Intel's providing technology to connect devices wirelessly to larger displays or projectors, which could be useful in conference rooms. In the second half of this year, Intel's also introducing technology so Cherry Trail tablets can be wirelessly charged in cafes, airports and other locations, which could reduce the hassle of carrying charging cables. The battery life on tablets may not get longer with Cherry Trail, but Intel's promising graphics and application performance. 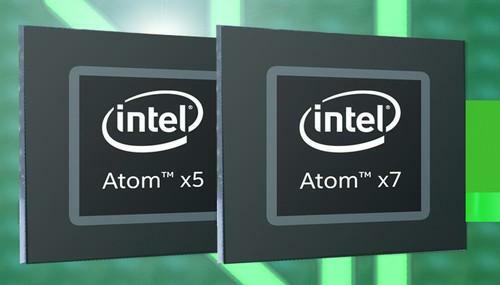 An Atom X7 chip provides two times faster graphics than the predecessor Bay Trail chip. The Atom chips are based on the Airmont core, which provides an incremental application performance improvement compared to the previous Silvermont core. Device makers will also have the option to pair 3G or LTE connectivity with the Atom X5 and X7 chips. Intel has had relative success in the tablet market, shipping more than 40 million chips last year. But with tablet shipments flat, Intel isn't expecting tablet chip shipments to top those numbers this year. Intel was aided in 2014 by the fact that it virtually bought its way into the tablet market by subsidizing Bay Trail and older Atom chips for device makers, and it isn't expected to do the same with its Cherry Trail chips as it chases higher margins. In a separate announcement, Intel also announced its latest XMM 7363 LTE modem, which will be in devices starting the second half of this year. The product provides downlink speeds of 450Mbps (bits per second), and supports 29 LTE bands. It also supports VoLTE (Voice over LTE), multi-SIM capability and LTE Broadcast for high-speed multimedia transfers.